I had a great moment of irony today, at least I think it was irony. You see, I was in the kitchen this morning, preparing myself a bowl of cereal whilst listening to John Prine's 'In Person & On Stage'. This song in particular was on. And about half way through the song, a Jehova's Witness knocked on the door. And as he gave me his spiel, I couldn't help but think about the line in the song where John sings "try to find Jesus, on your own". I really wish that these witnesses of Jehova would listen to this song and realize they should stop going door to door with their pamphlets. If someone is going to find Jesus, they'll find him on their own (he's got pretty good PR already, even without the door knocking). Also, they're pamphlet had picture of Jesus I've never seen before. He had a short haircut, with a well trimmed beard, and his hair was all gray. 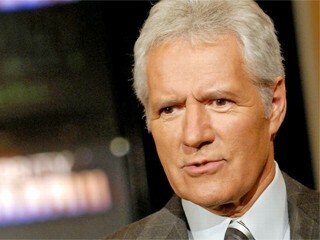 He kind of looked like Alec Trebek, if Alec Trebek were to sport a well trimmed beard and wear a dress.